Since the beginning of this year, all Janssen employees can make use of a considerable extension of parental leave. In particular this affects partners: “It’s important to build a relationship with a newborn for its development. The new policy gives both parents this opportunity, a nice addition to our modern HR policy. 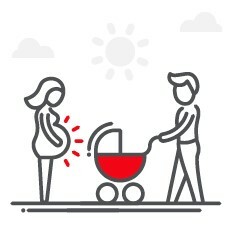 With this new policy, Johnson & Johnson further improves the position of females, since the care for newborns can now be divided between both parents”, says Hilde Claes, HR lead at Janssen Pharmaceutica. The new policy is rolled out in all branches of Johnson & Johnson globally. It allows partners and adoptive parents to take 8 weeks of parental leave with full compensation during the first year of the newborn. Pregnancy leave is not extended, but will now be fully compensated.